Making chocolates has been part of my life for over 30 years. I started out with a library book on truffles and then taught myself over time (and through much trial and error) to temper chocolate and dip assorted confections. Over the years, I have come up with many of my own original recipes for truffles and caramels, motivated by the pure enjoyment of the artistic processes of creation and discovery. To this day, I continue to experiment with new flavors and combinations, much to the delight of my family and friends. I have truly found my passion. In 2005, I decided it was time to start my own business and have happily been pursuing more formal training since. I graduated from Ecole Chocolat in 2007 and followed that with an internship in Minnesota, a class at the Barry Callebaut Chocolate Academy in Chicago on chocolate decorating, and a class in Canada on working with colors. There is so much to know and so many techniques to learn that I try to find something each year to expand my knowledge. I hope you enjoy my chocolates. 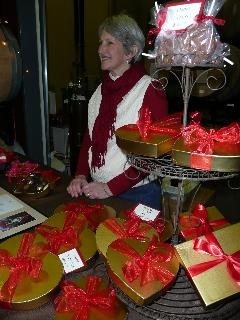 Julie with chocolates at William Church Winery.